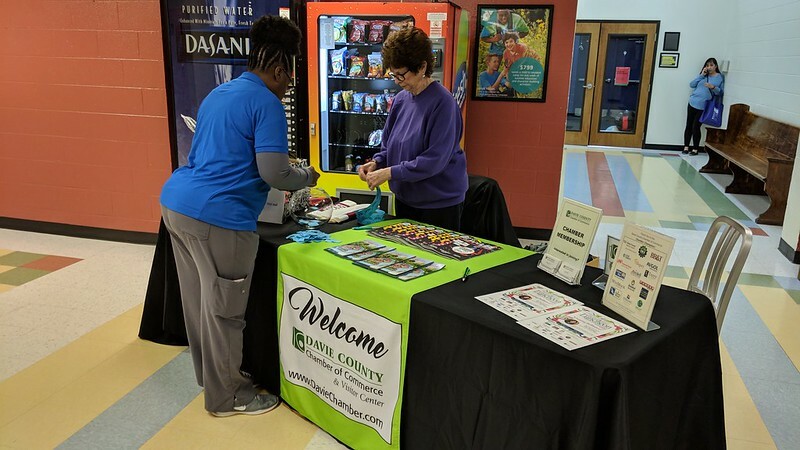 Hundreds of Davie County citizens took the first step toward improving their health by attending the 2019 For Your Health Expo presented by the Davie County Chamber of Commerce and the Davie Family YMCA. Sponsored by Wake Forest Baptist Health – Davie Medical Center, Foster Drug Company, Warren Hearing Solutions, and Snyder’s Cleaning Service, the For Your Health Expo offered access to important information as well as direct interaction with a variety of medical service providers. Several free health screenings were offered including cholesterol, blood pressure, spinal, bone density, and glucose. The Chamber appreciates the support of its event sponsors as well as the participating vendors, including: Allegacy Federal Credit Union, BB&T, Bermuda Run Family Medicine, Cardinal Innovations Healthcare, CapTelNC, Carolina SeniorCare, Davie County Board of Elections, Davie County Public Library, Davie County Recreation & Parks, Davie County Senior Services, Family Care Center of Mocksville, Farmington Community Events Center, Foster Drug Company, Granite Ridge Farms, Griswold Home Care, Healthy Made Simple, Home Instead Senior Care, Hospice & Palliative Care of Iredell County, Humana, Johnson Insurance Services, Mocksville Family Dentistry, Mountain Valley Hospice & Palliative Care, Natural Foot Care, Novant Health, Optimal Health Chiropractic, Pro-Activity North Carolina, Sam’s Club, Snyder’s Cleaning Service, Stagecoach Family Chiropractic, Trellis Supportive Care – Davie, VineLife Products, Warren Hearing Solutions, Wake Forest Baptist Health – Davie Medical Center, WS Al-Anon Informational Services and Zija International. The first step in any wellness journey is knowledge, and the For Your Health Expo is a great place to gather information about making healthy choices for your whole family. If you missed it this year, mark your calendar now for next year’s Expo on March 17, 2020!